Each of my children respond differently to correction. My older two quickly confess their guilt and move on. However, my third child possesses a tenacious knack for creative truth-telling. This kid will promise you he didn’t eat a cookie when his face is covered in chocolate chips and crumbs. He will tell you that he is dressed while clearly sporting his pajamas. He will promise not to hit his brother while delivering a right-hand jab. There is no shame in his game whatsoever. This can be graciously corrected because of his young age but I wonder how often we fail to confess the most obvious of transgressions to our father and what effect that might have on our soul. Some old school Catholic confession; it must have been an exciting weekend for the village. 1 John reminds us that we cannot hide sin from God. He knows everything about us, even our deepest most private thoughts. Despite this, we hide our naked bodies, like Adam and Eve in the garden, in the hope that we might overlooked among the trees. This is not possible. John teaches us that “if we confess our sins, his is faithful and just and will forgive us our sins…” This is great news. The only thing standing between you and purity is confession. However, John warns, if “we claim we have not sinned, we make him out to be a liar and his word is not in us. '“ This is bad news. Believe me, you don’t want to make God out to be a liar. It’s not a good look on you. 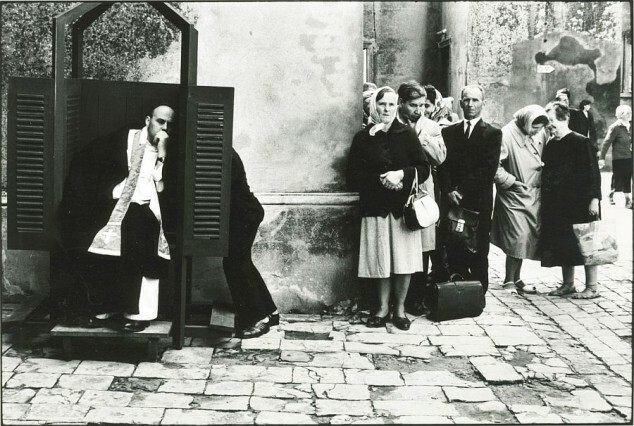 There is a Catholic tradition of confession to a priest. However, the Bible teaches us that no man stands between us and God and that we can approach the throne of grace directly in the confession of our sin. Do it today. Don’t make out like my four year old creative truth-teller. God sees you as you are and wants you to fess up to your own transgressions. He is faithful and just to forgive.